← $60.00 Raised for the American Red Cross Haitian Relief Fund on Sunday. 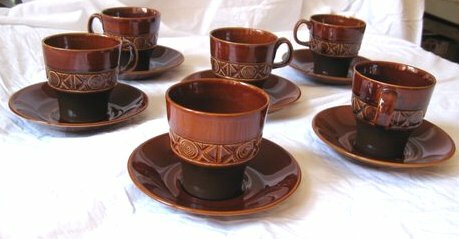 Beswick Pottery’s “Zorba” Sixteen Piece Coffee Service Contains Strong Greek Inspiration. 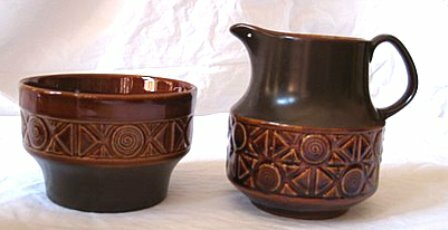 Pottery designer Graham Tongue created the thirty-two items for the “Zorba” dinnerware line of England’s Beswick Pottery in 1968. The name itself conjures up Greek origins and visions of passionate dancing complete with plate breaking. 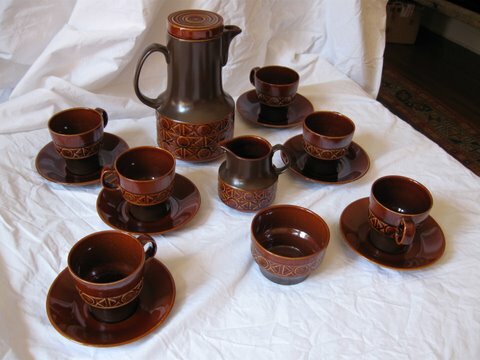 Offered here is the sixteen piece Coffee Service produced by the company from 1970 to 1973. Originally produced in two colorways, brown and olive green, both in a gloss finish. The decoration used geometric shapes of circles and triangles to create a border pattern for various “modern” shapes. 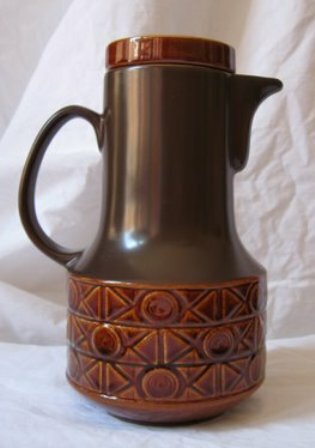 The brown finish, called “bronze,” was probably the “in color” at the time, and this is the color most often found today. The bronze items came in different combinations, one shade all over, dark brown and light brown (like this set), or in some cases three shades of brown. The dark brown has a satin matte finish. 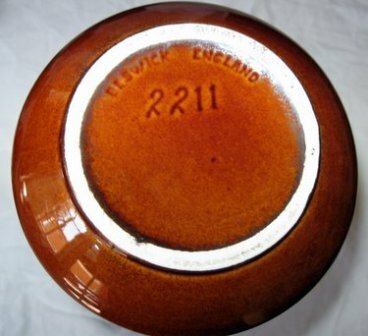 Beswick Pottery was founded by James Wright Beswick in 1896 although some historians say 1894. In 1898 a premises was opened on Gold Street, Longton, Stoke-on-Trent, England, still the home of Beswick today although it operates under the umbrella of the Royal Doulton Group. Throughout most of the 20th Century Beswick created beautifully decorated quick-selling lines of vases, pots, jugs, tea pots, trinkets and dinnerware. An early (1930) ad line read, “Everything the householder needs in earthenware”. The company employed many noted pottery designers including James Hayward, Albert Hallam, Mr. Symcox, and Mr. Watkin. These men were always given credit for their lines and many early collectors followed a specific designer. To this day the best resourse book on the company, The Charlton Standard Catalogue of Beswick Pottery, by Diana and John Callow gives designer credit on each item featured in their excellent reference book. In 1969 Beswick was sold to the Royal Doulton Group. 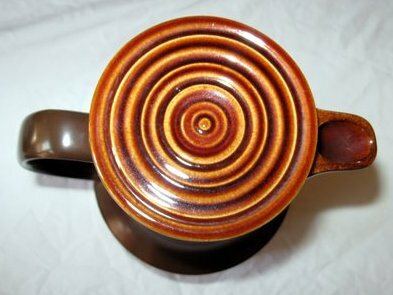 Billy Blue Eye Pottery is proud to offer this sixteen piece Coffee Service for $190.00. For more information and/or to purchase this great set, contact us directly at billyblueeye@cox.net. We accept MasterCard, Visa, Discover and Pay Pal and offer a full refund if not satisfied. This set is in excellent condition with no imperfections. We wish you all, as the Beswick Collectors Circle used to say, “Happy Beswicking”.